← “Have you no sense of decency, sir? 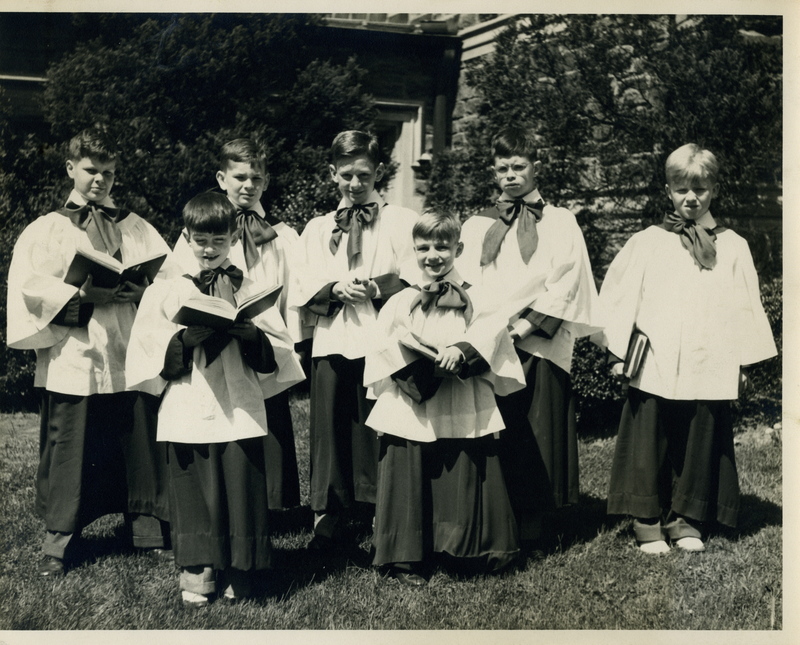 Boys choir, Saint Marks Methodist Church, Baltimore, Maryland, ca. 1947. While discussing over drinks the subtleties of triangle playing, Seiji Ozawa remarked, “Percussionists have to sing”. I played that vinyl recording over and over and over until I had memorized the entire set of songs. The recording was still in pretty good shape until one day I left it sitting on a windowsill without its sleeve. Returning home from school, I found the sun had shaped the vinyl into a wave band. I was crushed. But luckily the weight of the old tone arms was enough to keep its needle in the grooves, at least until it got close to the centre. All this took place either just before or just after I joined my neighbourhood church choir. I couldn’t read music, but I had a quick ear and in a short time grasped the fact that the distance between notes on a staff was related to the distance up or down in pitch. Using this visual crib, I became a pretty good sight reader and the boy soprano soloist. According to my Mother, I regularly made the older women in our congregation cry, but I was not aware of my powers at the time. The highlight of every season was a gigantic Christmas Eve service. Our organist and music director Edward Choate O’Dell [1.] always hired a string quartet, a brass quintet, two harpists and Timpanist Dr. William Sebastian Hart – all instrumentalists from the Baltimore Symphony Orchestra. I had a few good years. However, after an altercation with a new minister, I walked across the street and began singing in another church choir. That choir was directed by a man who also directed a choir in a high Episcopalian church in downtown Baltimore. He asked me to sing in the choir and just a few months after leaving one church I found myself in another. But the buzz was gone. Now through occasional fogs of incense I was singing Latin instead of Luther. I hadn’t a clue about the meaning of the words and somehow monody just didn’t do it for me. Making music couldn’t be much easier. [1.] Edward Odell gave a large party at his home just prior to one of our Christmas services and I attended with my mother. He owned one of the famous Baltimore brownstones, houses more thin than wide, but very deep and tall. O’Dell’s living and dining room displayed glass cases filled with precious objects of Art. I can only imagine now what they were worth. But at the back of the 1st floor was his bedroom and it was this bedroom I’ll never forget. Odell had purchased the Chinese teak bedroom set of Robert Ripley the creator of “Believe it or Not”. Not too long after posting this article I was contacted b the director of the Chinese Snuff Bottle Society. The Society was started by O’Dell and the cabinets I had noticed in his home had been filled with snuff bottles. A 3″ tall baottle recently sold in England for 2 million Euros. All my life Dr. Edward Choate O’Dell has been a hero to me. I remember very little about him, in fact I can’t visualize him today. But I remember how quiet he was during my audition for the boys choir, how carefully he went through the tunes as I sang. How kind he was at the end when he turned to me and said, “You have a good ear”. At a time when I could have been crushed, perhaps turned forever away from music, he did one of those rare things that provides one with an anchor for life and the self confidence to excel. He was a great teacher. After a 20 year absence, I had to return to Baltimore to attend a relative’s funeral. My first Pastor at Saint Marks, the Rev. Dr. E. Cranston Riggin attended the viewing as did Dr. Odell. I had not seen them since I was 13 years old. I was humbled by their thoughtfulness. Just ran across your post, and I was born and raised a member of St. Mark’s Methodist Church. I am only 35 yrs old, but remember Mr. O’Dell and the lavish Christmas Services. St. Mark’s closed it’s doors in 07′ but is still there, empty, on the corner. It was nice to see the picture and hear the familiar names. St. Mark’s closing truly hurt me. It is truly amazing to me that you discovered this post and I am so glad you took time to respond. I sent an e-mail to the president of the International Chinese Snuff bottle Society in Baltimore requesting a biography or photographs of Dr. O’Dell but have not received a reply. Perhaps I’ll purchase Dr. O’Dell;s book from the Society. I expect a photograph of him would be inside. and I’ll contact them to determine if their Edwin Riggin was my Edwin Riggins. As are you, I am saddened to hear St. Marks is vacant. Many important events took place in that building which directed me towards my ultimate profession; not the least was the wonderful Christmas Eve service which we both remember so fondly. Once more, Thank you for finding my article – I can’t imagine how you made the discovery – and writing me. I have attached your e-mail to the article. Sincere best wishes for the Holidays and the New Year. I am trying to get more information on Mr. O’Dell and St Marks as the build is for sale and We are interested in starting a music school. If anyone know more information please contact me.